What is an enzyme peel and what can it do for my skin? they get a little squirmish. "You're gonna do WHAT to my face?!" Truth is, there isn't any form of "peeling" involved. You may experience minor flaking (which is what we want) and tightness (again, what we want) but after a day or two, your skin will be more radiant, refined, polished, brighter, firmer, clearer, softer, more hydrated, evenly toned........do I need to go on? The benefits are COUNTLESS! An enzyme peel is a blend of natural fruit ingredients (enzymes) that dissolve dead skin cells, forcing the healthier/younger skin cells to shine through. This is called cellular renewal...and we want it! By speeding up the cellular renewal process, we are giving our skin a much needed work out. Our cells renew themselves typically every 28-48 days. The younger we are, the less time it takes but the older we get, the longer our cells take to replenish themselves. So, if we don't exfoliate and resurface our skin on a regular basis, we have icky, dull, dead skin literally clogging our pores, making our complexion look older. Gross, huh? That's what I thought! Enzyme peels help with acne, black heads, congestion, melasma/sun damage/hyperpigmentation, dry/dehydrated/dull skin, anti-aging and balancing the skin. Everyone can benefit from these treatments, especially since I customize them to suit your skin's needs. Another great and important benefit is that by sloughing off those dead skin cells, it makes it much easier for your active skin ingredients to penetrate into the deeper layers of the skin, working more effectively. If you are looking for more of a "PEELING" treatment, it's always great to boost these enzymes with a glycolic acid (great for decongesting, oily/acne prone and aging skin), lactic acid (great for hydrating and lightening), kojic acid (Lightens dark spots and redness) and retinol (great for oily/congested/aging skin). This makes your treatment much more aggressive, therefore, you will experience a little more than just flaking. If I have not treated your skin before, we first need to give you a regular enzyme peel to prep your skin in order to work towards a deeper, more aggressive treatment. You will also have to follow a home care regimen that I customize for you to get the best results possible. I use a fabulous and effective all natural, professional clinical line to insure optimal results. 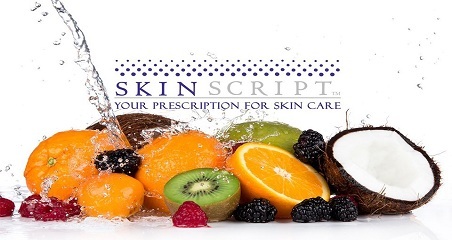 I love working with Skin Script RX because I can customize each and every treatment into something different, no matter how many times you visit! Raspberry Peach Enzyme- Raspberry contains high levels of polyphenol antioxidant ellagic acid which soothes skin irritations and reduces inflammation, while peach softens and is aromatically relaxing. Hibiscus flower and pumpkin add to the exfoliating properties of the enzyme. Hibiscus Flower is a gentle alternative to AHAs and has a moisturizing effect. It's an antioxidant that maintains skin elasticity, toning and is an anti-inflammatory. Coconut/Papaya Enzyme- This is the most gentle enzyme which is great for sensitive skin. Coconut and papaya enzymes dissolve dead skin cells, revealing healthy soft skin. The small molecular structure of coconut allows or easy absorption through the skin giving it a soft, smooth texture. Ideal for dry, rough, wrinkled skin. Benefits: Papaya is an excellent natural enzyme to digest and dissolve dead skin cells. Yogurt Extract moisturizes, smooths and stimulates cellular regeneration. Chamomile is ideal to replenish and enrich dry or sensitive skin. Anti-itching and antiseptic properties help to refresh and reduce inflammation. Lemon Zest Enzyme- This enzyme exfoliates and brightens the skin with the antioxidant and brightening benefits of lemon. Contains 8% arbutin, 6% lactic acid, 3% glycolic acid and 2% kojic acid. It promotes deep hydration and protects from environmental damage while relieving the surface signs of aging. Arbutin and Kojic provide extreme lightening capabilities. Suitable for normal and dry skin, sun damaged skin, hyperpigmentation. Benefits: Lemon is the perfect antioxidant to fight free radicals and provide brightening effects to the skin. Arbutin ad Kojic are natural lighteners to provide extraordinary fading of irregular pigmentaton. Pomegranate Enzyme- Pomegranate is a powerful antioxidant that brightens the skin. It contains 11% lactic acid, 4% alpha-arbutin, and 2% salicylic acid. It promotes deep hydration, reduced oiliness and lightens the skin from irregular pigmentation. Perfect for normal, aging, oily or acneic skin. Salicylic Acid is able to penetrate into the pore which contains sebum (oil) and exfoliates the dead skin cells that are built up. Ideal choice for tackling black and whiteheads. Blueberry Enzyme- The blueberry enzyme is another powerful antioxidant with 1% glycolic acid and 1% salicylic acid. It digests dead skin cells and softens sebum (oil). The antioxidants in the blueberries are a perfect anti-aging treatment that will create a healthy, beautiful glow. Suitable for all skin types except rosacea and sensitive. 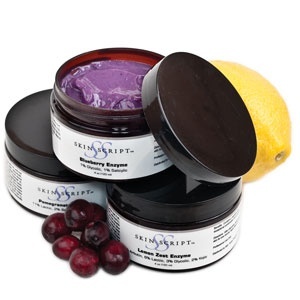 Benefits: Blueberry brightens the skin; great exfoliation for anti-aging. They protect skin from the damaging effects of free radicals associated with the aging process. They also contain vitaminc C & E.
Glycolic and salicylic are great for fine lines, mild acne and large pores.